The existing Intended Nationally Determined Contributions (INDCs) mean that both the hopes and the stakes are higher for the Paris talks than for any other round of climate change talks. 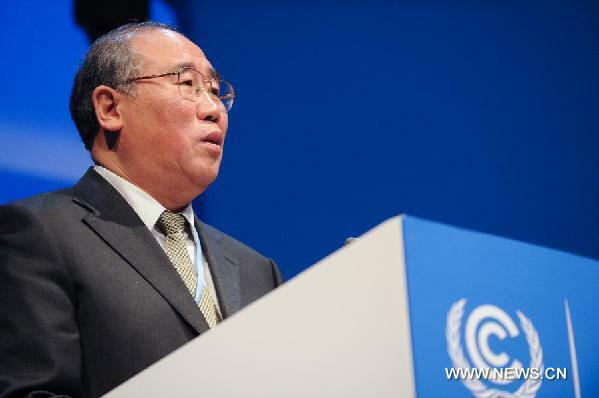 On 24 November, Xie Zhenhua, China’s special envoy on climate change, spoke at the Institute of Geographic Sciences under the Chinese Academy of Sciences on the points of disagreement at the talks and China’s position. The aim of the Paris conference is to conclude a protocol or legal instrument, or some kind of binding decision, applicable to all parties, on strengthening post-2020 action on climate change, based on the outcomes of the Durban Conference of Parties (COP). 194 nations participated in the Kyoto Protocol, but the US did not. This time we hope all nations will participate, with no exceptions. Everyone hopes the final outcome will be called something like the “UNFCCC Paris Implementation Agreement”. Some nations do not agree. The US Congress has said it will not ratify any global deal which restrains US action. So now the international discussion is on the possibility of an “agreement and decision”. An agreement has binding force and must be obeyed, while a decision is not binding and does not need ratification. If emission targets are part of a decision, they are not legally binding. A bottom-up emissions reduction model has taken shape. But its success or otherwise will be determined step-by-step during negotiations. • Establishing an international mechanism for the post-2020 global response to climate change. Prior to 2020, we already have the UNFCCC, which takes into account historical responsibility and national circumstances, and defines the idea of common but differentiated responsibility – that is, principles of fairness and respective capability. Under those principles the developed nations can cut emissions first and provide financial and technical support to the developing nations. Once developing nations have got that support, they take action in line with their own circumstances. The requirements of the UNFCCC were carried through to the Kyoto Protocol (which expires in 2020). In Copenhagen, 2009, the developing nations accepted the developed nations’ proposal that their mitigation actions be subject to “international consultancy and analysis”, while the developed nations agreed to provide US$100 billion of funding annually before 2020. But this was a political decision, without binding force. A genuine response to climate change will be linked directly to national development. Therefore we hope this meeting will spur a global green and low-carbon transition. Developed nations need to grow, too, to improve the lives of their people. Developing nations need to end poverty, to improve the livelihoods of their people, to grow the economy and protect the environment. Over the last year of talks each nation has come to accept in principle the idea of a low-carbon transition. It may be that without that transition we cannot reach our goal of responding to climate change. And every nation must make that transition. It looks now that the transition is the major trend, and once that trend is confirmed a market will be created. Technology, research and development, and investment will all shift to that market. We hope the conference will confirm this, and this would be a milestone in responding to climate change. Resolve the issue of most concern to developing nations: funding and technology transfers. Without that resolution it will be hard to persuade developing nations to cut emissions. China was once among the poorest of nations. Many of the least developed nations are still extremely poor, and relieving that poverty is their prime concern. A key measure of success for this conference will be resolution of this issue, which is of most concern to the developing nations. There is a lot of pressure on the developed world here: they must agree to come up with the funds, or the conference will not be considered a success. Under China’s national programme for responding to climate change, by 2020 carbon intensity should drop by 40-45%, and 15% of primary energy will come from non-fossil sources. Forest stock will increase by 1.5 billion cubic meters. China is hopeful of achieving these goals. Because China implemented them through the five year plans (FYP). China achieved its goals for the 11th FYP. In the 12th FYP, GDP energy intensity dropped to 16%, carbon intensity dropped to 17%. Those two targets have now been reached. With a still-growing economy China has avoided 3.5 billion tonnes of carbon emissions – that’s no easy thing. At the end of last year, the percentage of non-fossil energy in primary energy was 11.2%, so the 12thFYP goal of 11.4% is achievable. Forest stock has increased by 2.1 billion cubic meters. According to calculations by the World Bank and the International Energy Agency (IEA), China has accounted for 52% of global energy savings in the last 20 years. Development of renewable energy. China now has one quarter of the world’s installed renewable generating capacity (IEA figures). China accounted for 37-40% of additional capacity installed in 2013-2014. And because renewable energy is growing quickly in China, the industry is growing quickly globally. Renewable energy costs have fallen 50%. In the last decade hydropower in China has doubled, wind power has increased 60-fold, PV solar has increased 280-fold. Forest carbon sinks: China has the largest area of planted forests. The international community recognises these contributions. Our actions at home elicit strong support in negotiations. China is the world’s second largest economy and its largest carbon emitter. China is under pressure from the developed nations to graduate from the ranks of developing nations and commit to the same emission cuts as the developed nations, and provide the same financial support to the developing nations. Some developing nations have the same view. But China still has 70 million people under the poverty line and veryunevenly distributed development. Therefore, the developing nations need to bolster cooperation amongst themselves. Over the last three years China has funded South-South cooperation, paying for training in developing nations. Almost 2,000 officials and technicians in 120 countries have been trained to run projects, to raise funds, to compile emissions inventories, etc. Also China’s energy-saving products and technologies and early warning equipment has been given to developing nations; every year there are South-South cooperation projects. This year the government announced China will set up a CNY 20 billion South-South Cooperation Fund to undertake long-term south-south cooperation projects. This has been featured in China’s joint statements with the US and France. The relationship between the agreement coming out of this conference and the UNFCCC. The developed nations hope there will be none, while the developing nations believe this agreement will be made under the UNFCCC and must embody UNFCCC principles, as one more step towards strengthening action on climate change – not a replacement for the UNFCCC. This issue may be resolved at the talks. But it looks currently as if the basic principles of the UNFCCC – common but differentiated responsibilities – may be retained. No country objects to that principle currently. The focus now is how to differentiate responsibilities among country groups, and whether a dichotomy should remain. The US and some other nations believe that since now we have the INDCs every country are free to decide how much effort they make based on their own capabilities. China insists on a dichotomy, because up to this point the relative developmental stages of countries have not changed fundamentally. So we should still draw a line here: China is a developing country. Even if we maintain this dichotomy, it will not stop developing countries from doing more, better. How to embody the UNFCCC principle (common but differentiated responsibility) in dealing with specific issues. The current focus is how to differentiate between developed and developing nations in emissions cuts, adaptation, funding, technology and transparency, and also in furthering ambition. And underlying this is the issue of “graduation” – the US, Japan and Australia say countries such as Korea, Singapore, Qatar, Mexico and Chile should graduate from the ranks of developing nations and be classed as developed, and so should China. That means talking about standards for that, but if that happens we won’t see any outcome from this year’s conference. So maybe it won’t be discussed this year, but it will be talked about sooner or later. What is the target for global climate change efforts? The IPCC has suggested restricting temperature rises by the end of the century to 2C would be acceptable. A rise of over 2C would mean enormous environmental damage. Some small island states, which could be wiped out by sea level rises, say it should be 1.5C. The developed nations say the 2C target alone isn’t enough, there must be controls on emission cuts (but there has been no consensus on emission cut targets). Currently everyone is proposing having adaptation targets in addition to the 2C target. China has proposed increasing the ability to adapt to climate change for all countries. For example, by establishing early warning systems, that would be the first step towards being able to withstand climate change. And if you work out how many of those systems are not yet in place you can work out how much money is needed. But as that money would have to come from the developed nations, whether or not that goes ahead depends on what happens in the talks. Also, the developing nations are still poor and need to develop. Quantitative emission reduction targets would often leave them no room to do so, so agreement is hard to reach. The Kyoto Protocol was a top-down model – a level of total emissions was set and quotas allocated; now we have a bottom-up model, with countries setting their own targets in line with their capabilities, and that model is basically accepted now. This is to China’s benefit, and we have still set ambitious targets. We have the intended contributions, but these are inadequate to meet the 2C target. So the EU has proposed an assessment process, to be carried out every five years: if your targets are found to not be ambitious enough you do more. China agrees there should be assessments, but these should be overall assessments rather than of individual cases – add all the national plans together and assess how much more needs to be done, then make up that gap according to the principle of common but differentiated responsibilities. It will definitely be the developed nations that will provide funding. In the agreement we want to make clear how the money flows – from the developed nations to the developing nations. The developed nations have a duty to do this, and it’s been included in China’s joint statements with France, the EU and the US. The disagreement is over what the developing nations should do. China has of its own accord set up the South-South Cooperation Fund. But should developing nations provide the funding they are able to, or the funding they are willing to? Developing nations want to talk about adaptation as well as cutting emissions. In the current agreement there’s basically agreement that both are equally important. The disagreement is over how to decide how much should be spent. The developing nations say give us what money you can then we’ll decide what to do accordingly. The developed nations say no, you need to come up with strategies and needs, then I’ll provide the money you need. So that’s why China proposed a specific aim, building early warning systems, rather than talking about how much money to provide. This is what the developed nations are most insistent on, otherwise there will be no mutual trust. China says it has cut emissions by 3.5 billion tonnes, the developed countries say that’s what you say, but we want a single international transparent mechanism to do those calculations. That is reasonable. But then there should also be transparency on funding. Recently it was calculated the OECD nations had provided US$62 billion to developing nations. There should be transparency on that too – you say you’ve spent that, so you should make it clear who you gave it to, what they did with it, which country got it, was anything done with it? That’s transparent. A genuine response to climate change means you have to say what you’ve done and what the outcomes have been, so you need a single system of transparency. The developed nations propose a single level of transparency, but we say it should differentiate. Developing nations don’t have the same capabilities, so the frequency and content of disclosures should be different. Ordinarily, every country would be subject to the same binding force. But circumstances in the US mean that any international document that places restrictions on US actions will not pass Congress. In the end, the result might be an “agreement and decision” model. The African State group said that years of climate change have created more extreme climate events, resulting in loss and damage to developing nations, so they hope to see compensation mechanisms established. I’m afraid that the developed nations will not accept that. This might be discussed at the talks, as the African States group is very insistent. The main obstacle here is the intellectual property issue. It’s basically not possible to reach long-term climate goals using traditional technology, you need new technology, there has to be innovation and technology transfers. So we need to solve the problem of intellectual property protection. China has proposed a window for technology transfer in the Green Climate Fund, with a sum of money to be used for purchasing technology. Developing nations don’t necessarily need the latest technology, but rather the best practical technology, low-carbon green technology. There are some technologies that have been more than a decade old and are not that expensive, which could be bought via that funding window for use globally. Countries could cooperate on new technology, with the intellectual property being held in common; these are solvable problems. Technology transfer is essential for the next stage of increasing ambition and achieving long-term targets. An important post-Paris issue will be regular checks (progress evaluations) of INDCs. Whether that is of individual countries or global emission reductions, standards need to be proposed. Currently EcoEquity and the Stockholm Environment Institute have come up with a model to achieve fairness, taking into account the different fundamentals of the developed and developing nations, and worked out that China’s INDC is ambitious. It’s valid whether you look at 2030, 2050, per-capita emissions, per-capita historical emissions. Currently various research institutes are carrying out their own assessments; ideally the UN should commission a third party to do that. But also, ideally, China would have its own assessment outcome worthy of recognition. This book review was originally published at ChinaDialogue.net under Creative Commons' Attribution-NonCommercial-NoDerivs 2.0 England & Wales License and 2.5 China License.